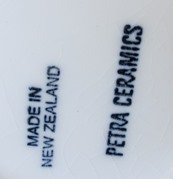 Petra Ceramics was situated at Mt Eden. I found a mug in my drawer.. 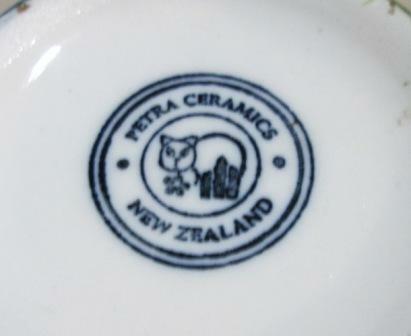 I applied for a job at Petra Ceramics when we retuned from Oz in the early 1990's. I didn't get the job and I'm sure that the reason was that I was a potter and asked too many questions. Sadly one woman (PETRA) and her mother made this business, and then sadly it took one man whom new little about business and ceramics to sink the business. I still mourn the loss of this factory. I've heard something along those lines clutterchick, but can't recall who told me about it at the moment...... Do you know the year that Petra closed down? Hi, I just realised that I have two coffee mugs from Petra. Bought them back in the 90's when several potters had their wares available on a party plan system similar to tupperware. does anyone remember that? 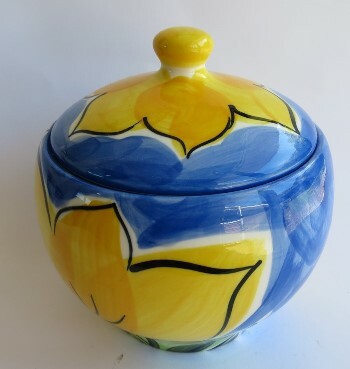 I bought a few pieces of Barry Doyle, one is a bowl with an amazing spiderweb pattern, some spice containers and a holey container (?) 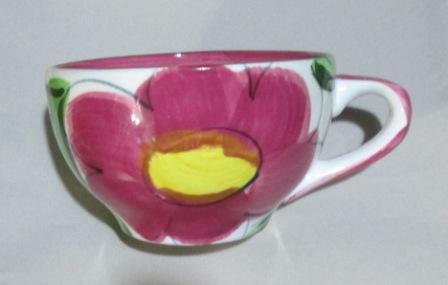 that I use for resting soap on, (cannot remember who made them but style is similar to Petra,) and the Petra cups. Dark blue with lemons. 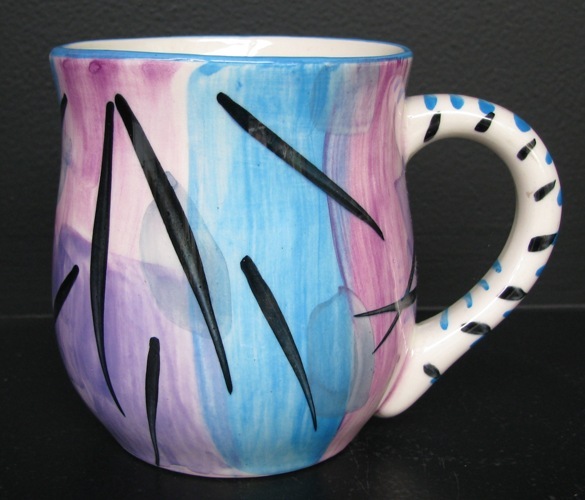 Glaze is very smooth and a lot like my two Keriblue mugs that I have fallen in love with recently. 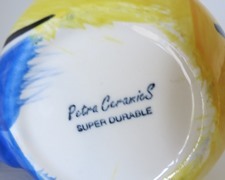 Re closer date of Petra Ceramics. Other details: The company’s Mt Eden lease expired without the business being sold, so the company was put into liquidation. Mr Walker is a director of Investment Management Consultants Ltd & Walker Solutions Ltd, and is a former director of South Pacific Merchant Finance Ltd. THE MAN THAT BOUGHT THE BUSINESS WAS A SHOCKER~~BELIEVE ME~~THE BUSINESS COULD HAVE BEEN A TRUE SUCCESS IN THE RIGHT HANDS. ~~I OWN DOZENS OF PIECES OF PETRA LEMON AND PETRA EDEN. ~~I COLLECTED TWO OTHER PETRA SETS WHICH I HAVE NOW PARTED WITH. ~~I ALSO HAD TILES MADE FROM FOUR LARGE SUSHI PLATES PLACED TOGETHER WITH ONE LARGE PETRA LEMON SYMBOL PAINTED ON. VERY BEAUTIFUL SET AS AN ELEMENT SPLASH BACK IN MY ALL WHIE KITCHEN. ~~I WAS SO PLEASED THAT I PICKED UP THESE ALREADY PAID FOR ITEMS~BEFORE THERE DOORS CLOSED. ~~I ORDED THESE A COUPLE WEEKS BEFORE THE DOORS CLOSED FOR THE FINAL TIME~~THERE ARE MORE DETAILS TO THIS FINAL MISSION TO PETRA CERAMICS. ~~I HOPE THIS HELPS? ~~CHEERS. I met Petra once, she lived in Akiraho St Mt Eden at the time and we lived around the corner in Sylvan Ave and I was a real estate agent so you meet a lot of locals. There was a shop in I think Mt Eden Rd, maybe Dominion (?) where she sold beautiful things. Now at the time I was not a Petra collector so I took little notice, except popping in occasionally to window shop. From memory they sold "experimental" stuff seconds etc there as well. Those one offs would now be increasingly valuable but of course I had no idea at that stage. They also had in there Christine Harris stuff as well, again from memory. 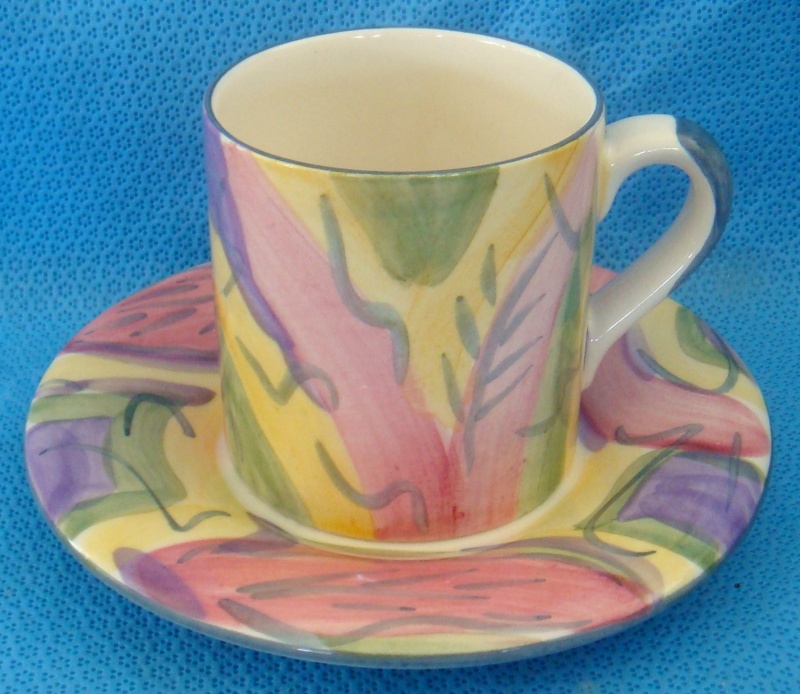 I fell in love with my first Petra about ten years ago when I picked up a Petra Pacific teapot and three large coffee cups and saucers fro only $15 at a car boot sale. So I mainly have Pacific and also a bit of blue Flora and yellow Flora. 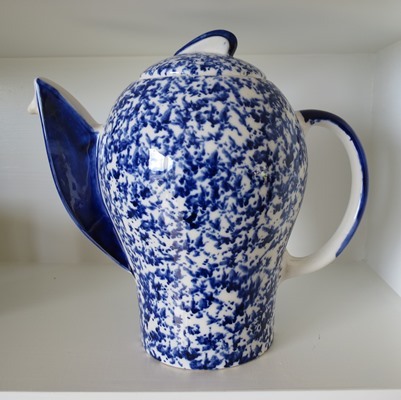 My blue flora teapot may be rare as it is overprinted with a promotional message "Sir Thomas Lipton tea", I picked that up fro $5 in a café selling off stuff they did not want. I'll try and get some pics up if anyone interested. 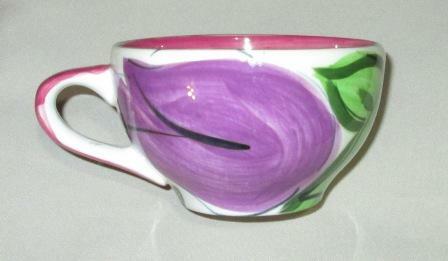 I like the colour and the glaze as well. Definitely interested in photos as I have no idea of the pattern names that Petra produced. Cheers Ev. Hi Ev. I just found my camera! But I need to charge the batteries (a 2 day process). 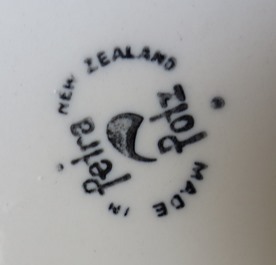 You can see heaps of Petra patterns on Trademe and (most) have the name on the bottom of the piece, some don't though and I think some were experimental rarities, whereas others were produced en masse. 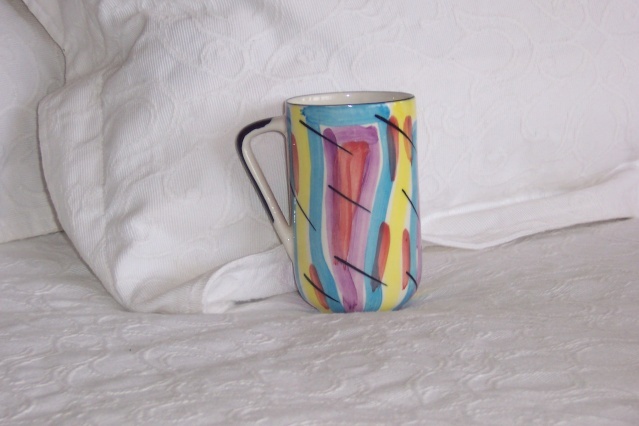 They must be handpainted of course as they all vary ever so slightly. I would like to see a picture of your tiles, sounds lovely, special one off! I have a collection of Lemon Petra that I collected through the 90'. I still love it very much. Recently there was an accident in my kitchen where my glass cabinet fell off the wall. 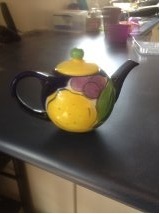 In it was my Lemon Petra Teapot. Fortunately the rest of my collection is displayed in another room but now I am left with the task of trying to find out how much my little gem of a teapot was worth. I honestly don't remember how much I paid for it at the time. From memory there were originally 2 different sizes of teapots and I believe I purchased the smaller of the 2...4 cup teapot I think it was. I have also just realised my Lemon Petra Salt Pig was in the glass cabinet as well. If anyone has any information of the amount these items cost, I would very much appreciate it. Even just a ball park figure would be a wonderful start. I was quite elated, even more when the assistant congratulated me on finding a set, and charged the princely sum of $1 for it!! There is nothing quite like the joy of a successful hunting expedition eh? Don't think I've ever seen that pattern before either! Wow! now that is truly a tale of a determined CL sleuth , glad true read that it was THE cup that you found. 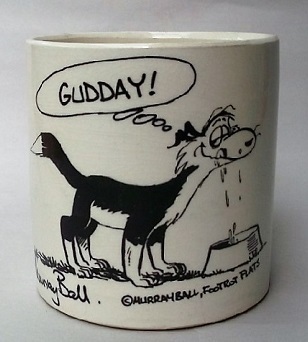 Gee, ever spied something in a shop and not bought it for the perfectly reasonable explanation that you have no room for said item, then instantly regret that decision and hope it is still there next time you go, but know that it will be gone? That was me last week when I saw a Petra lemon pattern tray (?) quite large but in perfect condition. It would have looked nice with my other lemon stuff sitting on it. 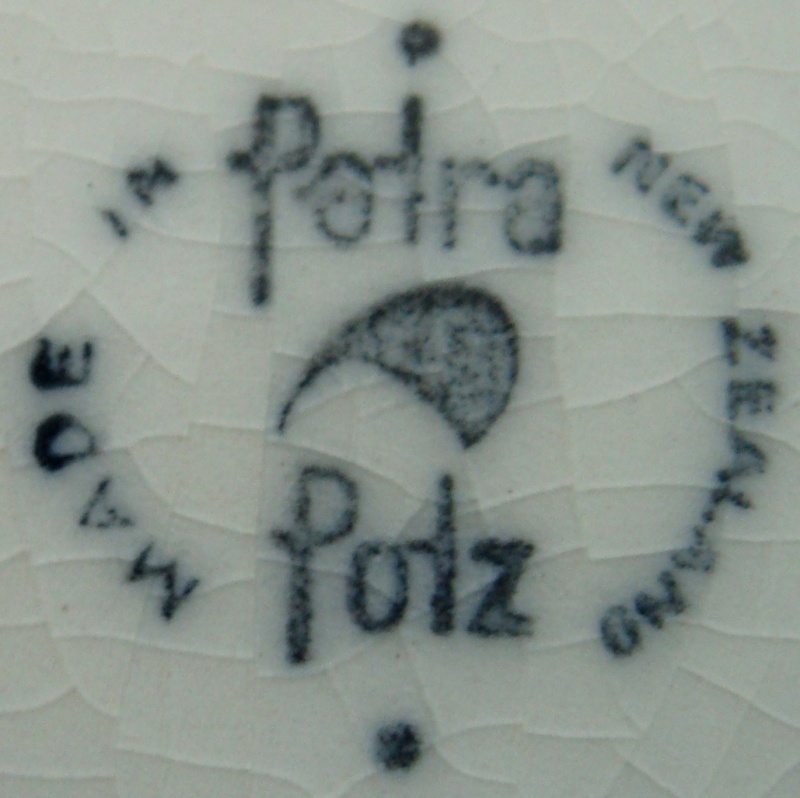 I have been gaining respect for Petra Ceramics (AKA Petra Potz). My love affair started with these items I bought for my cousin - then couldn't give up the lovely big fat vase. This is a kitchen container... too big for a sugar bowl, too small for a vege dish. This pattern is Flora Blue. 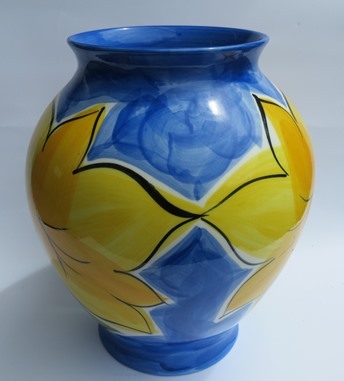 You can see why I ended up keeping this big fat vase... 26 cm tall and so bright and cheery. Then this totally mad coffee pot popped up on TradeMe. Mine for $20. Crazed and stained inside, it's actually been used. 21 cm tall. 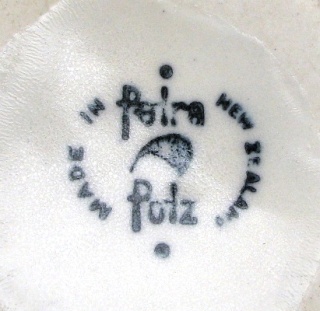 This is Petra Potz, which I think is an earlier mark than the later Petra Ceramics variations. 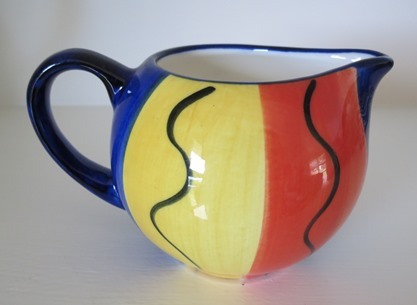 I also have a mug in this glaze. 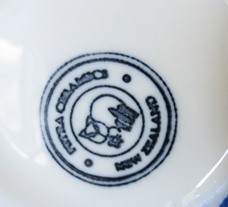 Here are some Petra marks.. from a selection of mugs. 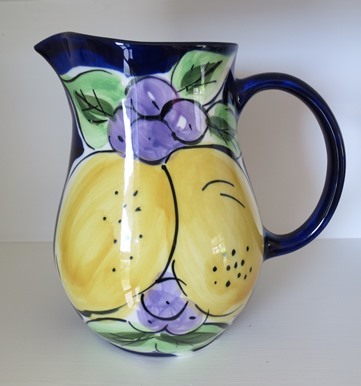 This jug is 20 cm tall, the pattern is Eden. 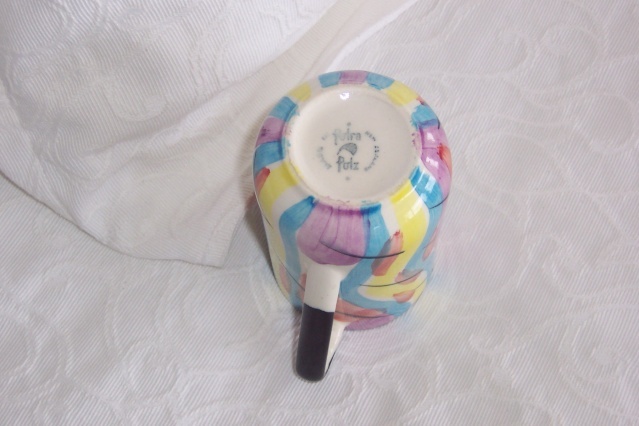 And this wee cream/milk jug is 6 cm. Not sure of the pattern name. Well.... so it does! The plot thickens.